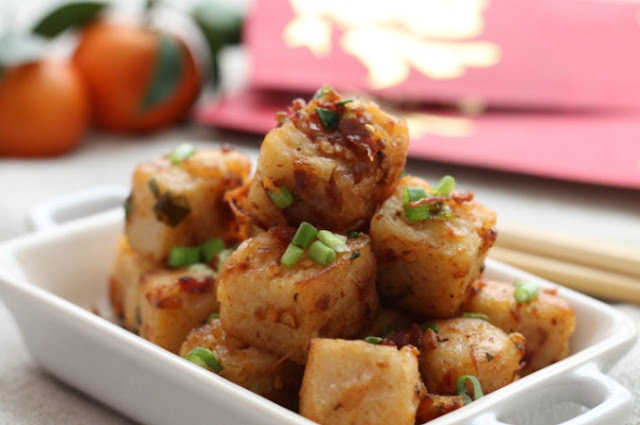 my bare cupboard: Loh bak goh / turnip cake "
I made this by frying some cubed turnip cake and added a teaspoon of XO sauce and 1/2 tsp chili sauce . My winter won't be complete without making turnip cake . Though it's a tad time-consuming to make , imagine grating more than a kilo of turnip ? 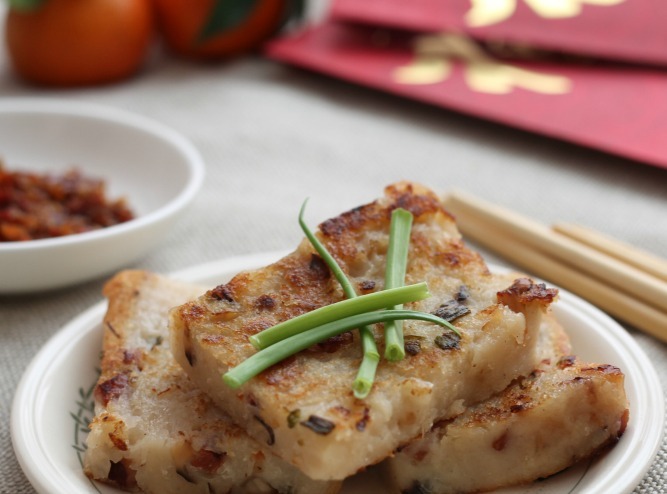 Turnip cake is popular during Chinese New Year but you can order it all-year round in Chinese restaurant as it is commonly served during yum cha ( a Chinese-style morning or afternoon tea ) . It is really easy to make er except the grating part and really tastes delicious er I just love it . 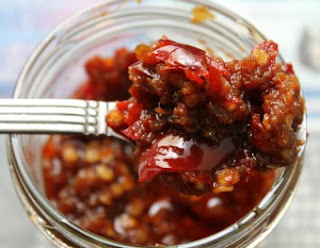 Best served with chili sauce or hoisin sauce and a cup or three of coffee or tea . * Wash , peel , rinse and grate turnip , drain in a colander with a bowl under it to collect the juice , reserved juice . I drained the radish for 30 minutes and got 1 1/2 cups radish juice . * Combine rice flour and tapioca flour , add the radish juice and water gradually , whisking the mixture as you pour . * In a wok or a large pan , heat some oil , add shallots , sausage and mushroom , cook for 2 or 3 minutes then add in the grated radish , stir well to combine . Add the XO sauce , brown sugar , salt , white pepper , chicken powder and five spice powder , stir well and cook for a minute or so , adjust taste then add the spring onion . Turn off heat , add in the flour mixture and mix well . Pour mixture in lightly oiled 9-inch cake pan . Steam on medium high heat for an hour . Let cool completely before removing from the pan . Garnish some diced spring onion on top . Slice and fry , serve hot . * Rinse chilies and shrimp . Place chilies in a bowl and add 1 cup of boiling water ; place shrimp in another bowl and add in remaining boiling water , soak both for 30 minutes . Drain well and reserve soaking water . * Heat wok or a pan , add a little bit oil and stir fry shallots until soft , add in the chilies and the shrimp , cook until fragrant . Transfer to a mini food processor and add in some of the soaking water , process until smooth or in my case , not too smooth . Pour back in the same pan and add the remaining soaking water and cook until all the liquid evaporates , add in the ham and sugar and adjust taste . Pour in the peanut oil and stir well to combine and simmer for 2 minutes more . Let cool and store in an airtight container . This is must have during CNY. Delicious! Ooh my! I'm drooling already! I love this! The last time I made this was ages ago, when I harvested my radish from my garden, it was not enough, so I bought more radish from the market to add on. My family's favourite! Love it! I could finish the whole tray myself for both lunch and dinner! Seriously! We love to dip the fried radish with our favourite chili sauce, "Lingam Thai Chili Sauce", awesome! I love the first pic, make me wanna pick each piece right into my mouth! Look so delicious! that would be my breakfast. We are lucky that we have lots of tools (also know as toys - LOL!) to help us! Your turnip cake looks great! You should make more since you have a processor - LOL! Hi Anne, this looks delish! My grandmother used to make this. I have never acquired her skills but I shall try my hand at it sometime. Wow Anne! This is one of the must-order item whenever I go Yum-Char. Looks like staying in Hong Kong has greatly influenced your cooking too! Will do next time :D Thanks ! 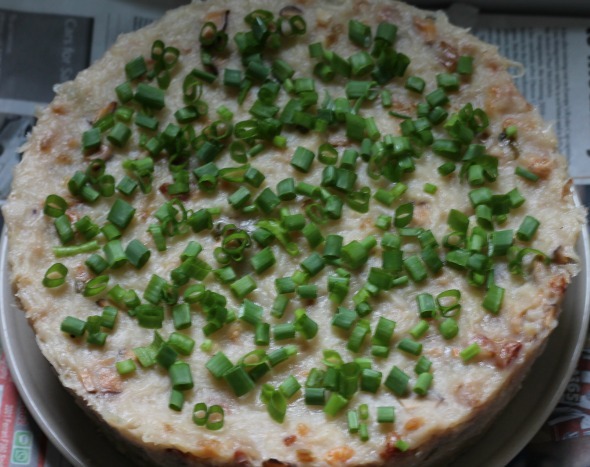 Hi Anne, I dont really like turnip cake but yours look so good, Im so tempted to try it! This sounds very interesting. I have never heard of a turnip cake before, but you make it look fantastic! I am looking for Print option? Have I gone blind or is it not there? Your turnip cake looks and sounds delicious! Can I use fresh cooked shrimps? This is one of my favourite when i go yum cha. I like the pan fried version. Oh wow!! yours looks great in both version.